Venture into China’s bitterly cold northeast and, resting on the south bank of the Songhua River, you’ll find the aptly named “Ice City”. 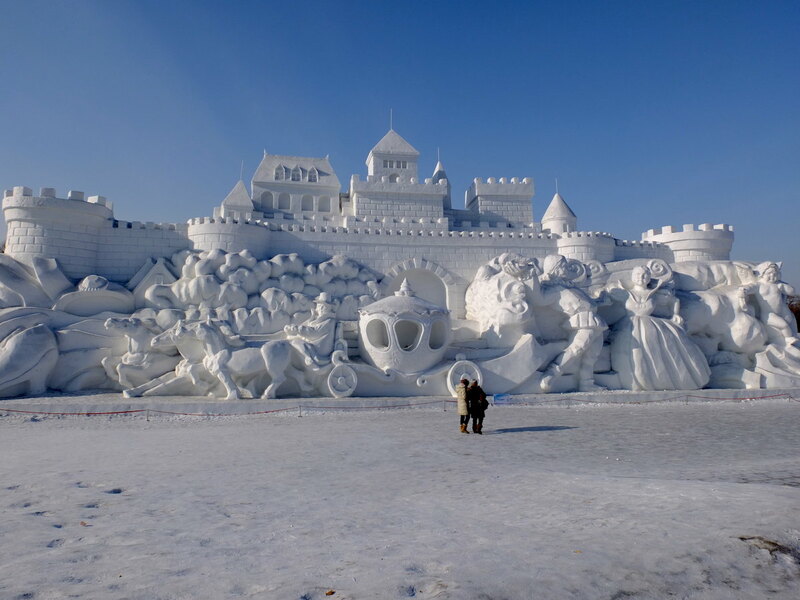 Harbin, the capital of Heilongjiang province, is famed for its frosty winters and spectacular ice festivals. During the winter months, temperatures can drop to as low as −40 °C (−40 °F) and the Songhua River regularly freezes over with ice that can be up to one metre (3 ft.) deep! In spite of this somewhat inhospitable weather, Harbin remains the cultural and economic centre of not only Heilongjiang province but also Northeast China in general. Since the shape of Heilongjiang supposedly resembles that of a swan, Harbin is often affectionately referred to as “the pearl on the swan’s neck”. Historically speaking, it is a relatively new city set in a region that was once known as Manchuria, which was ruled by the Manchu people. Its name, which was originally a Manchu word meaning “a place for drying fishing nets”, is a testament to the fact that it was once just a quaint fishing village. It wasn’t until 1898 that plans were drawn up to develop this small settlement into a major city. The Russian Empire, which was in the process of financing the construction of the Chinese Eastern Railway, wanted to use the city as a base in northeast China to aid with the administration of the railway. When it was initially established, the city became home to an overwhelming majority of Russian immigrants, who exerted a powerful influence over its culture, architecture, and cuisine. During the Russian Revolution of 1917, refugees flocked to Harbin and, at one point, it had the largest Russian population of any city outside of the Soviet Union. On August 25th 1945, the city came under the control of the Soviet Army, who eventually handed power over to the People’s Liberation Army in April of 1946. In this way, Harbin became the first large city to come under the jurisdiction of the Chinese Communist Party. While much of the Russian-style architecture has tragically been replaced, there are a number of well-preserved exceptions that have earned the city the nickname the “Oriental Moscow”. 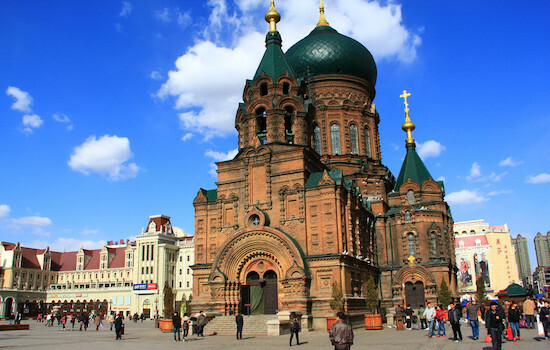 The most magnificent remnant of Harbin’s multi-cultural past is undeniably Saint Sophia Cathedral, a Russian Orthodox church located in the central district of Daoli. This elegant work of Byzantine-style architecture was originally built in 1907 and was eventually converted into a museum in 1997. What could be better than learning about the history of Harbin from inside one of its most venerable historic buildings? Other areas of architectural interest include Harbin’s Old Quarter, which contains many buildings of the Baroque and Byzantine-style that were built by the Russians during the 19th century, and Zhongyang Avenue, which is an eclectic mixture of stunning Baroque and Byzantine facades, traditional Jewish architecture, Russian eateries, French boutiques, American fast food chains, and Japanese restaurants. While many of the buildings in the Old Quarter are unfortunately falling into disrepair, Zhongyang Avenue is still a lively tourist hotspot that comes alive at night. During the summer, the street is lined with beer gardens that are sure to tempt the thirsty shopper! However, when Saint Sophia Cathedral and the other foreign edifices were initially built, many local Chinese people felt that it damaged the city’s feng shui. In response, they donated money to fund the construction of Jile Temple or “Temple of Bliss”, which was eventually completed in 1924. This spectacular work of traditional Chinese architecture is the largest Buddhist temple in Heilongjiang province. Alongside these Christian and Buddhist houses of worship, there is also the Harbin Jewish New Synagogue, which contains exhibitions on the history of the 20,000 Jews who once lived in Harbin. 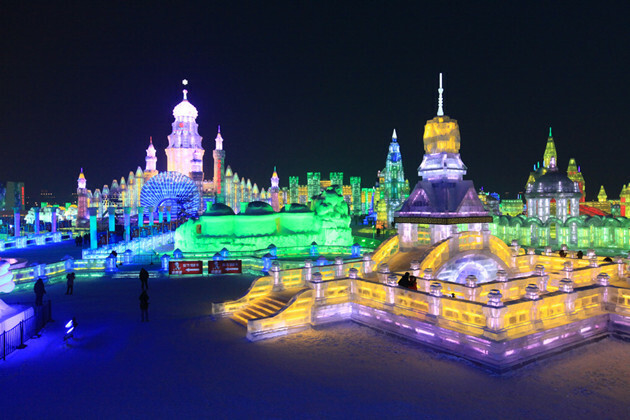 Fascinating though these historical buildings undoubtedly are, Harbin’s greatest draw is the International Ice and Snow Festival, which has been held annually since 1985. During the winter months, the city is decorated with stunning ice and snow sculptures carved by artisans from across the globe. The two main exhibition areas are Sun Island and “Ice and Snow World”. While Sun Island predominantly showcases the finest snow sculptures of the festival, Ice and Snow World is a miniature functioning city made from ice, which is illuminated at night to create a spectacular explosion of colour. Every year, over 15,000 people work tirelessly for 16 days in order to bring this winter wonderland to life! If the thought of careering down an ice slide or winter-swimming in the Songhua River gives you the chills, there’s always the Harbin International Beer Festival, which is held every August. In terms of capacity and scale, it is technically larger than Germany’s Oktoberfest, and features live musical acts, entertaining performances, and, of course, plenty of beer!